After a long hiatus, the Tang Spirit newsletter returns this week with a trio of poems by Wang Wei translated by Lan Hua. Tang poetry, landscape painting and Chan Buddhism -- Wang Wei was a genius of all three disciplines. And what’s even more remarkable is that sometimes he managed to incorporate all three of these talents into a single work of art. The poems we have translated for this week’s newsletter are a case in point, a series of three poems called Yu Gong Valley. These poems are masterful examples of Tang regulated verse composed in the jueju style, with five characters per line, arranged in four couplets each, all subject to a precise rhyming scheme. 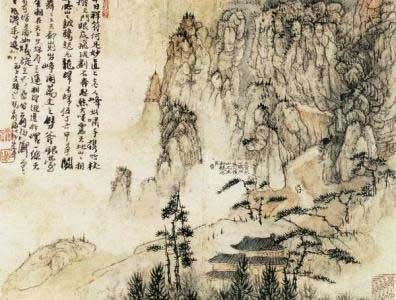 The poems describe a trip that Wang Wei took with a friend (or perhaps a servant) to the Yu Gong Valley. This is a real place somewhere in north central China and Wang applies his considerable skills as a landscape artist to provide just enough detail in the three poems so we can picture the place clearly. And being a disciple of Chan Buddhism, these poems also quite clearly describe Wang’s internal journey. Thanks to his extended metaphor, we are rewarded with quite a good glimpse into the inner Yu Gong Valley as well. In order for you to better enjoy these poems, a further word about the title may be helpful. Yu Gong Valley is one of those Chinese place names that carry a dense association of meaning. It is a real place in China and there is also an old folk story to go along with it about a nobleman who pursues a deer on a hunt. As such, it is almost impossible for a translator to capture the rich context in a simple phrase. Even David Hinton (who is probably one of the best regarded non-academic translators of Tang poetry working today) struggles with these poems and ends up translating the place name as, Duke-Simpleton Valley, which falls short of the poetic, at least to my ear. More importantly, while Hinton’s translation may be literally accurate, I think it also obscures the point of Wang’s deeper meaning here. For me, Yu Gong is a paired concept, much like Yin and Yang, that is best understood across a range of possible meanings – Yu which can mean stupid, crude or imbecile and Gong which can mean Duke or noble or lofty. So rather than provide a precise meaning, however accurate, I would prefer to preserve the lovely sound of the original name and make you good readers work a little bit harder to grasp at what Wang is saying. In this way, I am at least partially trying to adhere to good Daoist practice (and Daoism, after all, is a fundamental part of Chan Buddhism) in the way I have approached the task of translation, by paying heed to the notion of intentional inaction, or wu wei (无为), the hope being that translating best may sometimes be achieved by translating least. It sounds easy doesn’t it?